Mrs. Washington has a mottled tom-cat, (which she calls, in a complimentary way, ‘Hamilton,’) with thirteen yellow rings around his tail, and that his flaunting it suggested to the Congress the adoption of the same number of stripes for the rebel flag. Not only did Atherton report the story as true without question, she changed a number of details. Instead of a tomcat named Hamilton, she had Hamilton being called “Mrs. Washington’s Tom-cat.” She also had the story being printed in the Tory press, a detail not mentioned in the original. In her timeline, she had this taking place in 1777 instead of 1780. Granted, Gertrude Atherton’s The Conqueror was a work of historical fiction, but this book had much influence upon future generations of Hamilton biographers. His reputation as a gallant spread far beyond the confines of the camp. A Tory newspaper managed to weave Hamilton’s notoriety and the proposed new American flag into a single withering sneer. “Mrs. Washington,” it reported, “has a mottled tom-cat (which she calls, in a complimentary way, ‘Hamilton’) with thirteen yellow rings around its tail, and that his flaunting it suggested to the Congress the adoption of the same number of stripes for the rebel flag. Despite quoting the original source, Schachner like Atherton placed this story in 1777 instead of 1780 and had it printed in a Tory newspaper. He also used this tale as proof of Hamilton’s “reputation as a gallant” and “notoriety,” something not mentioned in the original. Martha Washington, in one of her droller moments, had nicknamed the house pet, a bigheaded, extremely amorous tomcat, “Hamilton”—a glimpse of his reputation as a ladies man in those days. With each new Hamilton biography, this tomcat apparently grows larger and more lustful. Burr: Martha Washington named her feral tomcat after him. Not only is the story repeated, with the tomcat being “feral,” but even Alexander Hamilton says the story is true. If Hamilton says it’s true, then it must be. Right?!? This is most likely a tale spread by John Adams later in life. But I like Hamilton owning it. At this point in the story he is at peak cockiness. The story of Martha Washington’s tomcat has thus become so universally accepted that the original source has been all but forgotten. Somehow, it has become a story that was spread by John Adams, which no previous biographer mentioned. Thirteen is a number peculiarly belonging to the rebels. A party of naval prisoners lately returned from Jersey, say, that rations among the rebels are thirteen dried clams per day; that the titular Lord Stirling takes thirteen glasses of grog every morning, has thirteen enormous rum-bunches on his nose, and that (when duly impregnated) he always makes thirteen attempts before he can walk; that Mr. Washington has thirteen toes on his feet, (the extra ones having grown since the Declaration of Independence,) and the same number of teeth in each jaw; that the Sachem Schuyler has a top-knot of thirteen stiff hairs, which erect themselves on the crown of his head when he grows mad; that Old Putnam had thirteen pounds of his posteriors bit off in an encounter with a Connecticut bear, (’twas then he lost the balance of his mind;) that it takes thirteen Congress paper dollars to equal one penny sterling; that Polly Wayne was just thirteen hours in subduing Stony Point, and as many seconds in leaving it ; that a well-organized rebel household has thirteen children, all of whom expect to be generals and members of the High and Mighty Congress of the “thirteen United States” when they attain thirteen years; that Mrs. Washington has a mottled tom-cat, (which she calls, in a complimentary way, ‘Hamilton,’) with thirteen yellow rings around his tail, and that his flaunting it suggested to the Congress the adoption of the same number of stripes for the rebel flag. Let’s look at some of the anecdotes from Smythe’s entry. Are any of the above anecdotes true? Did George Washington really have thirteen toes, the extras having grown since the Declaration of Independence? Did Lord Stirling really have thirteen rum-bunches on his nose? Did Philip Schuyler really have thirteen hairs on his head? Did Israel Putnam really have thirteen pounds of his posterior bit off by a bear? Did Martha Washington really have a cat with thirteen stripes on its tail? Did the idea of having thirteen stripes on the American flag really come from this cat? Obviously, this entire entry by Captain Smythe was a piece of sarcasm. It was all a joke. No one in 1780 would have believed any of these stories. No one now should believe them either. Admitting 1) that the story was satire and 2) that Martha Washington had no tomcat, the fact that this Captain Smythe wrote about a tomcat being named Hamilton still shows that the British in 1780 knew that Hamilton was a “tomcat.” Right? 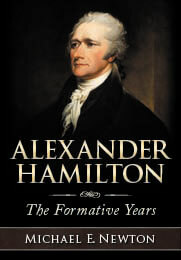 Moreover, the tale was reportedly published in the “Tory press.” Thus, everyone knew that Hamilton was an “extremely amorous,” “lascivious,” “feral tomcat.” Right? This story first appeared for public consumption in 1860 in Frank Moore’s Diary of the American Revolution. In sharing the story, that book cites “Smythe’s Journal.” The book’s “list of authorities” shows that this was the “Diary of Captain Smythe, of the Royal Army.” In other words, this was a private journal or diary of a British officer. “Smythe’s Journal” was not a “Tory press” or newspaper. Thus, the tomcat story did not appear in the Tory press nor was it disseminated to the public in 1780. Admitting 1) that the story was satire, 2) that Martha Washington had no tomcat, and 3) that the story did not appear in the press in 1780 and was not known until 1860, it is still a fact that this tale written in 1780 likens Hamilton to a “tomcat.” This still proves that Hamilton was widely known on both sides as an “extremely amorous,” “lascivious,” “feral tomcat.” Right? Which of these two definitions did Captain Smythe have in mind? Was Smythe’s fictional “mottled tom-cat” just a male domestic cat? Or was Smythe’s fictional “mottled tom-cat” a “sexually aggressive” male cat? To answer this, we are not interested in today’s definition of “tomcat.” We need to determine what the word meant in 1780. 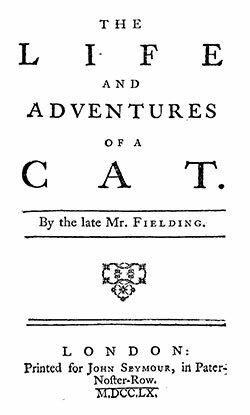 In 1760 was published an anonymous work ‘The Life and Adventures of a Cat’, which became very popular. The hero, a male or ‘ram’ cat, bore the name of Tom, and is commonly mentioned as ‘Tom the Cat’… Thus Tom became a favourite allusive name for a male cat…and people said ‘this cat is a Tom’ or a ‘Tom cat’. The Oxford English Dictionary gives further examples of the word tomcat being used in literature. 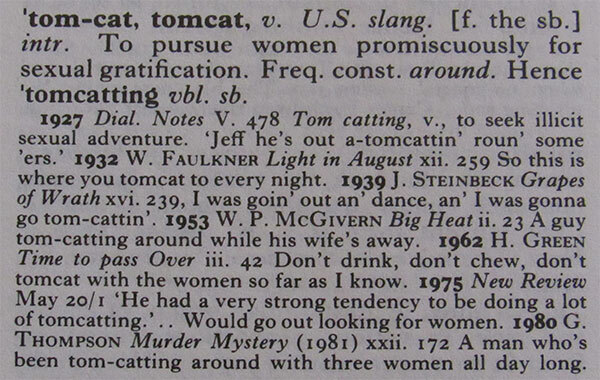 At least through 1881, tomcat simply meant a male cat and had no sexual connotation. Thus, when Captain Smythe made up a story about a tomcat in 1780, the word tomcat meant “a male cat” and nothing more. The term tomcat had no sexual connotation at that time. Accordingly, Captain Smythe never meant for Hamilton to be seen as an “extremely amorous,” lascivious,” “feral tomcat.” In fact, Smythe wrote that Martha name the tomcat Hamilton “in a complimentary way.” The tomcat story was never meant to disparage Hamilton. Martha Washington did not have a tomcat named Hamilton and probably didn’t even have a tomcat at all. Certainly, she did not call Alexander Hamilton a tomcat. The tomcat story was a satirical tale written in 1780 by Captain Smythe in his private journal. Captain Smythe did not call Hamilton a “tomcat” nor did he imply that a tomcat was named after him because of his reputation. The tomcat story first appeared in print in 1860. The word “tomcat” had no sexual connotation when the story was written in 1780 or when it was first published in 1860. As with last week’s blog post, yet another story supposedly proving that Hamilton actively pursued the ladies and was a “tomcat” has been proven false. The final conclusion: ALEXANDER HAMILTON WAS NO TOMCAT! This essay is based on a lecture given July 7, 2016, at Liberty Hall Museum as part of CelebrateHAMILTON 2016. The lecture was widely covered by the media. The Associated Press wrote about it under the title “A Hamilton tale too tall? Group disputes tomcat story.” The AP story was then republished by NBC New York, The Washington Times, The Boston Globe, the San Francisco Chronicle, The Seattle Times, Entertainment Weekly, the New Delhi Times, and many others. Local coverage included TV media and the story was independently reported by NJ.com and the Union News Daily. There will be no blog post next week because of the Jewish holiday of Shavuot. The next blog post is scheduled for May 29, delayed one day because of Memorial Day. Please join me tomorrow (May 15) at 6 p.m. at the Anderson House in Washington, DC, for the Society of the Cincinnati 235th Anniversary lecture. I will be speaking about Alexander Hamilton’s Revolutionary War Service. “Smythe’s Journal,” January 1, 1780, excerpted in Frank Moore, Diary of the American Revolution 2:250. Gertrude Atherton, The Conqueror 163. Nathan Schachner, Alexander Hamilton 92. Ron Chernow, Alexander Hamilton 126. Lin-Manuel Miranda, “A Winter’s Ball,” Hamilton. Lin-Manuel Miranda, Hamilton: The Revolution 70. The Grand Union Flag with thirteen stripes made its first appearance in December 1775, long before Hamilton and Martha Washington first met. Frank Moore, Diary of the American Revolution vol. 2 and 2:250. Frank Moore, Diary of the American Revolution 1:vi. Chambers’s English Dictionary of 1867, 1882, 1893, 1900, and 1904. Webster’s Handy Dictionary of 1879 and 1905; Webster’s Collegiate Dictionary of 1917. Merriam-Webster’s Collegiate Dictionary, 11th Edition (2004), 1315. © Posted on May 14, 2018, by Michael E. Newton. Please cite this blog post when writing about these new discoveries. Thank you! Arrgh… this story! Now listen here! When I got my 8 week old tabby kitten, in May, 2016, I named him Shere Khan, after the Tiger in The Jungle Book. When I discovered “Hamilton: an American Musical”, that July, I immediately changed it to Shere Khan Hamilton, BECAUSE Hamilton as a cat’s name was a valid historical precedent! I used the WHOLE name for an ENTIRE YEAR, until I felt that he knew that he that he was Hamilton, and that is what I call him now. He is 2 years old, and I’ve been calling him Hamilton for nearly two years. I am BLOODY F*****G WELL *NOT* changing his name again! 1. Pluto is a planet. Inner, outer, it’s still a planet! 2. Hamilton and Laurens were lovers. Whether or not their relationship was ever consummated, I can’t say, but it was definitely ROMANTIC LOVE! 3. There is valid historical precedent for naming a cat not just Alexander, but specifically Hamilton! If you want to fight me on any of these, I will gladly meet you on the Field of Honor. Dawn. Pistols drawn!